Let this trio of festive penguins wish your loved ones Happy Holidays this year! The cards feature a layered look and glitter adorning the arctic birds. 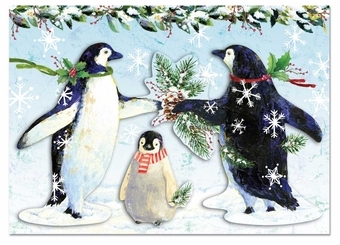 The big penguins wear sprigs of holly with berries, and the little one has a scarf. Too cute! Inside, the message reads "Wishing you Peace and Joy".